Josh is competing in a weight-loss challenge with his coworkers. He is in the final stretch of the contest (5 more days) so this week he is sticking to a meal plan that has an emphasis on lean protein with lots of fruits and veggies. For dinner last night I whipped us up a healthy chicken salad. Cilantro and jalapenos are two of my favorite things to add to soups, chilis, and salads to give things extra flavor, and I added them to this Chicken Salad as well. It is also full of crisp celery and very light on the mayo...so it is low in calories but high in protein...which will leave you feeling full and satisfied. Plus it doesn't skimp on the flavor. 1. Boil Chicken until done, let cool, and chop into chunks. 2. Chop up celery, green onions, cilantro, and jalapeno into small pieces. 3. 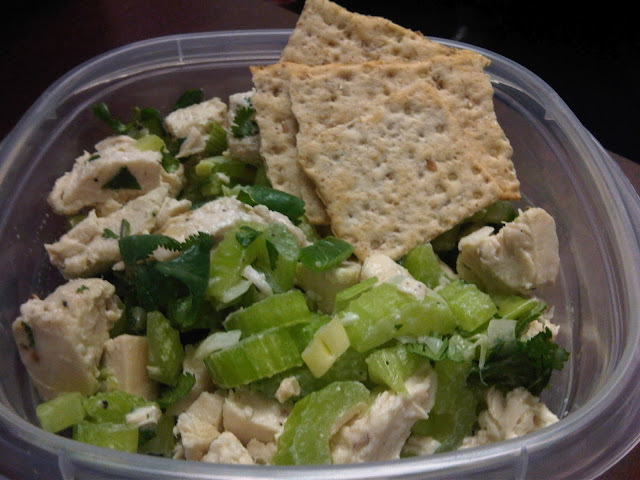 Place chicken, celery, green onions, cilantro, and jalapeno into large bowl. 4. Sprinkle with Garlic Powder, Sugar, Salt, and Pepper. 5. Squeeze juice of lemon onto mixture and add Mayo. 6. Mix well, and enjoy. I like to serve mine with either an avocado half or crackers. I had the leftovers for lunch today! I made this for lunch this week olivia! I was actually at the grocery store and couldn't remember the recipe and luckily found it through searching for your blog on google. :D I'm excited to nibble on it all next week. yay!